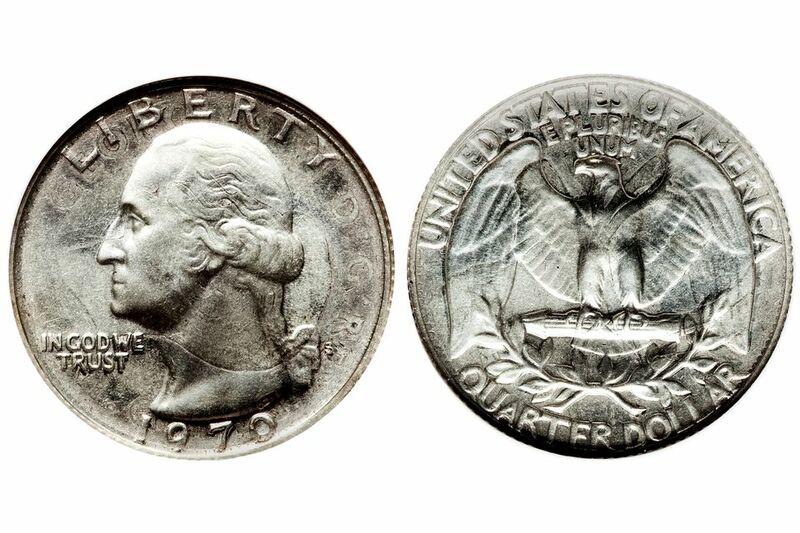 The value of a 1970-S Washington quarter depends upon a number of factors. Between the Philadelphia, Denver, and San Francisco mint facilities, over half a billion quarters were made in 1970. Therefore, the 1970 quarter is quite common and can still be set found in circulation today. However, a few error coins have sold for thousands of dollars. The United States Mint first minted the Washington quarter in 1932 as a commemorative coin to celebrate the 200th anniversary of the birth of our first president. From 1932 until 1964, the coins were made of an alloy of 90% silver and 10% copper. In 1965, the mint began producing quarters that consisted of outer layers of 75% copper and 25% nickel clad to a core of pure copper. In 1976, special collector editions were minted in 40% silver. Beginning in 1992, the mint began producing special collector coins in 90% silver and 10% copper. In the June 2016 edition of Woman’s World, an article titled Quarters from 1970 Are Worth an Eyebrow-Raising Amount Now by Meredith Bodgas brought attention to a special 1970-S Washington quarter. Bodgas writes, “And while it's no surprise that many 200-year-old coins are worth more than the standard value, some 1970 quarters could be worth far more than 25 cents. How much more? How about a yearly salary's worth!" Her article is referring to the 1970-S Washington quarter that was struck over a 1941 Canadian quarter. The rarest 1970 quarter was produced when a 1941 Canadian quarter was fed into a coin press at the San Francisco mint set up to produce Proof quarters. You can see the remnants of the 1941 Canadian quarter design on the surface of the Washington quarter. Behind Washington’s neck, the outline of the top of King George’s head is clearly visible. Just below that, the remnants of the “R” from the inscription REX is obvious. Upon closer inspection, you can see all the details from the original 1941 Canadian quarter. Numismatic Guarantee Corporation authenticated the quarter. A normal 1970 quarter weighs 5.67 grams, has outer layers of 75% copper and 25% nickel bonded to an inner core of pure copper. This coin matches the specifications of the Canadian quarter weighing 5.83 grams (+/- 0.04 g.) and chemical analysis revealed it was composed of 80% silver. Although nobody knows for sure how this coin was made, there is a lot of speculation. Since the United States does not make Canadian coins, the only way a thirty-year-old coin could enter the United States Mint facility is with some help from the inside. This quarter is not the only bazaar 1970-S Proof Washington quarter made at the facility. There is also a specimen struck on a 1900 Barber quarter, and one struck on a twenty-five centavos piece from the Philippines. 1970 Washington quarters made at the Philadelphia and Denver mint can still be found in circulation today for face value. Collectors seeking an uncirculated specimen can acquire one for a few dollars from their favorite coin dealer. Specimens minted at the San Francisco mint were specially made for collectors who purchased Proof Sets and can also be acquired for just a few dollars. A few high-grade specimens have been certified and sold at auction for record prices.